Let Go And Drop The Anchor! Is it something from the past that you can’t let go of? Is it something you are worried about in the future? Do you find yourself trying to control the situations around you? I find myself in the midst of every one of these questions above and I imagine you have at some point in your life as well. A lot of the time when I find myself worrying about the future or clinging to the past, I find that the devil is the one that is putting those worries, regrets and fears into my mind. All of those negative feelings – worry, regret and fear are from the evil one. The only way to live free is to be Anchored In something. That seems like a ridiculous statement but it’s true. In order to be free from the shenanigans of the devil, we have to be Anchored In Christ. I invite you to purchase Micah’s book today to learn how to experience a power-full life in a problem-filled world. The book is available where all books are sold. I know Micah Maddox has touched my life as I find myself anchoring more and more in the truth of God’s word and cutting the cord of the devil’s lies. Let Micah lead you on a journey to experience God’s power in a deeper way. 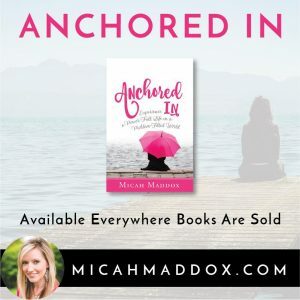 This entry was posted on September 5, 2017 with tags: anchored in, micah maddox by Deanna Young.